Thunderbird head men’s basketball coach Todd Simon has announced the promotion of John Wardenburg to Associate Head Coach ahead of the 2018-19 season. Wardenburg has served on Simon’s staff both seasons in Cedar City as an Assistant Coach. He was hired in May of 2016. "Coach Wardenburg has been a tremendous leader for our young men,” Simon said. “He's a tireless worker and has provided valuable insight on and off the floor as we build this program." 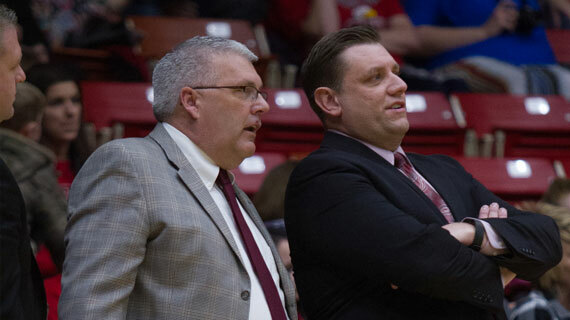 In two seasons coach Wardenburg has helped the T-Bird advance from a six-win program to a team that played in the quarterfinals of the Big Sky Conference Tournament last Spring. Prior to his arrival in Cedar City, Wardenburg spent nine seasons as an Assistant Coach at Brigham Young University. He also had several other stops including more recent ones at BYU-Hawaii, Indian Hills Community College and Westlake High School. The T-Birds will open their regular season competition on October 30 inside the America First Event Center with an exhibition matchup against Life Pacific. Follow the Thunderbirds all season @SUUBasketball on Twitter and Instagram and by liking the Southern Utah Basketball page on Facebook. Read all about the Thunderbirds on www.suutbirds.com.